Susan Gunn received international recognition when she was awarded the Sovereign European Painting Prize 2006. For her Norwich Castle solo exhibition she has created a contemplative atmosphere in the heart of the City, with work which nevertheless dazzles the eye with colour. Her beautiful, highly sought after, abstract paintings combine spiritual weight with surface incident. To appreciate the work of Susan Gunn is to acknowledge her intimate accord with the materials of ancient techniques. Using size and gesso, pigment and wax, she creates works of art informed by the golden section, which invite the eye to wander over surface detail that is created as much by accident as within the grand design of the artist. Surface becomes paramount as the viewer succumbs to the pleasure of candy colours or cathartic blacks. 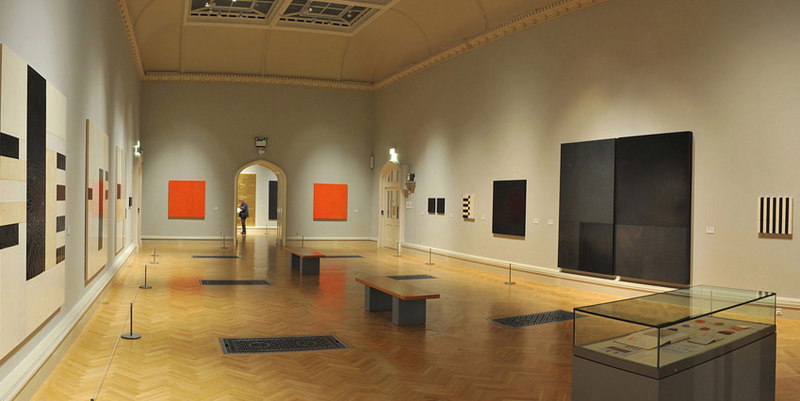 Gunn's control of monochrome is that of a colourist and her black spaces, white surfaces and colour planes of crimson, orange or gold leaf seduce the eye with a satisfying certainty, despite their deliberately random quality. The surface of a Gunn painting has a tectonic quality, the plates of colour having moved to create cracks and crevices, before coming to rest in a lasting ground, just as the earth has formed in moments of heat and cooling.